A main contributory cause of much of the ill health suffered today is the mineral deficient soils that bear our crops. 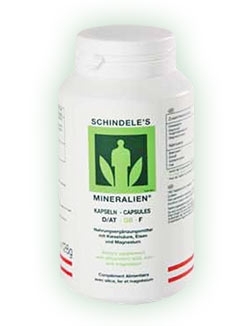 Schindele's Mineralien provides a full spectrum of over 90 minerals & trace elements to make up for the deficit in our diets. The mineral deposit for Schindele‘s Mineralien™ is a volcanic plug of amphibolite facies metamorphic paragneiss, created due to a crack in the earth's surface. The exact composition found there is not found anywhere else in the world. As well as the mineral content, the solubility of the minerals, or their transformation into other minerals involving the release of particular atoms and molecules, is vital to the efficacy of the stone powder. It contains minerals such as silicon, potassium, iron, magnesium, calcium, sodium, phosphorus and aluminium* as well as metallic trace elements such as manganese, zinc, boron, vanadium, copper, chrome, cobalt, nickel, titanium, niobium, molybdenum, silver, selenium etc. A natural source of paramagnetic energy, this is an excellent all round supplement which also helps to improve the uptake of the nutritional elements in your food. This is a broad spectrum mineral supplement having a tremendous range of potential health benefits. * the aluminium content of Schindele‘s Mineralien™ poses no threat to health (please see the download on the further reading tab for more details). We can offer Minerailien at a better price than the manufacture's website. Whilst their price is lower, it does not include shipping. Add those two elements together and you will find that ours is the better price. For example, a 4 stone child (25kg) being 1/3 the weight of the adult, would take 1/3 of the amount. Where this is not a whole number of capsules it can be spread over several days i.e. 3 caps one day, 3 the next and then 2 the next and so on. Do not take at the same time as medication or homeopathic treatments – do not take within at least 3-4 hours! Do not take with black or green tea, coffee or milk, as these can block the uptake of iron. Not within 1-2 hours! Do not take Vitamin E supplements or oils with a high Vitamin E content together with the minerals. Not within 1-2 hours! Drink plenty of liquids – stools may be black in colour, as metabolised products and non-absorbable minerals e.g. iron may be excreted. A broad spectrum mineral supplement consisting of paramagnetic rock dust. This has a tremendously wide range of potential benefits taken at the full recommended dose of 8 capsules daily. Paramagnetic volcanic rock powder that contains all the minerals and trace elements in the earth's crust (90) in colloidal form. Works in an opposite but complementary way to Ionic Minerals and Trace Elements. People today are suffering from many forms of chronic illness; a main contributory cause, is the mineral deficient soils that bear our crops. Paramagnetic volcanic rock powder works by providing a full spectrum of minerals and trace elements, to make up for the deficit in our diets. There are several groups of extremely healthy and long lived peoples around the world such as the Hunzas of Pakistan, and the Vilcabamba people of Ecuador. A number of Hunza men and women over 120 years old still work in the fields every day. What do they have in common? Mineral rich water. Soil bacteria work in collaboration with plant roots to facilitate proper nutrient uptake from the soil. The destruction of Beneficial micro-organisms in soil further degrades the quality of food produced. At one time we routinely ingested these organisms with daily intake of vegetables - not so now with our modern farming methods. Healthy fertile soil is a rich dark colour due to the presence of these good bacteria, which can be seen under a microscope. "The atoms or molecules of a substance having net orbital spin magnetic moments that are capable of being aligned in the direction of the applied field” Any substance, including soil or rock that will move towards a magnet is paramagnentic. Schindele's Mineralien is a paramagnetic rock dust, of volcanic origin, ground into a fine powder. It was discovered from a breach in the earth's crust, in an Austrian quarry, a volcanic, brittle material. Volcanic rock shows itself to be the most paramagnetic (measured using a CGS meter), this is the reason it is so successful in restoring healthy plant growth and remineralisation in people. Paramagnetic rock dust will help to build up the mineral reserves in the body, compensating for the mineral and trace element deficiencies in most diets. The mineral elements in paramagnetic rock products are just like protein, fats and carbohydrates - helping to create the physical and chemical conditions for the functioning of the cells They are concerned with the building up of hormones, and enzymes and are important constituents of the bones, teeth and tissues. Since these minerals and trace elements are continuously exchanged and lost, they need to be taken in by in body regularly. Our so called civilised ways of living, industrialisation, mechanisation, and the intense electromagnetic fields generated by modern technologies, produce high levels of anions. These can make us feel heavy and exhausted, with prolonged exposure can be a contributory factor in any health disorder. Broadly speaking, the volcanic rock dusts, with their predominance of silica is strengthening to our overall constitutions and structures of the body. They work steadily but more slowly than the ionic electrolyte minerals, which are also essential on a regular basis to help balance the fluid and electrical activity of the body. These minerals work rapidly to maintain essential functions. We recommend either Ionic Liquid Minerals or Mag Sea Ionics in this regard. An example of this phenomenon was shown with an experiment carried out using mineral supplement called Floramin. This is created by feeding a pro-biotic culture with coal . Coal is formed from primeval rain forest which through millions of years compression has formed into coal. The test involved three separate groups of rats. Over a period of 90 days group one was fed a nutrient deficient diet, these rats lost weight and became ill. The second group also received a poor diet, but were given the full spectrum, multi-mineral trace element supplement in small quantities. Group two gained weight and were in excellent health and fared slightly better than group three that received what was considered a high quality diet! So, small, but regular daily doses of these full spectrum food supplements generally improves the uptake and utilisation of the nutritional elements in our food. Even when are eating well we are not utilising the nutritional elements in our food properly, due almost universal trace element deficiency. At this point it is worth mentioning about the fallacy of the health benefits of drinking distilled water, from the false belief that the minerals in drinking water clog the circulatory system and are not nutritionally useful. It is well known that where people consume hard water, which has a higher mineral content than soft water, that there is a definite protective influence on the circulatory system. This shown by a study on 76 Swedish communities, those consuming hard water had a 41% less incidence of heart disease and 14% less strokes than those consuming soft water) It would seem prudent not to consume distilled water which is completely deprived of minerals' and acts to remove minerals from the system. So once again mother nature knows best, and will provide some ionic (soluble) and some colloidal mineral and trace elements, in muddy/sediment rich rivers, and clinging to the food we would eat in a natural situation. Since we are now so removed from natural situations, in practice, the most successful ways of restoring to our optimum health and longevity is by observing and applying all the good things that we have left behind from nature on a daily basis. In the years leading up to Chernobyl, some dairy farmers in Austria were using remineralization as a part of their operations. They added rock dust to liquid manure as well as combining it with compost, thereby removing odors and greatly increasing soil biota. As a result, cows had twice the normal lifespan and produced much more milk. Amazingly enough, after Chernobyl, the cheeses that were remineralized (as well as biodynamic cheeses) measured no radioactivity whatsoever. Austrians would stand in long lines in order to buy these safe, remineralized products. The year before Chernobyl, I co-produced a documentary in Europe on remineralization and visited some of the companies that were producing rock dust to be used specifically for agriculture and forestry, including the company of Robert Schindele. He discovered that the trees and plants on his property that were growing alongside gravel roads were stronger and healthier than the trees that were not. Schindele deduced that this was because cars driving on the gravel produced a cloud of rock dust that settled on the nearby vegetation and positively affected their growth. This led him to promote and publicize the rock dust that he produced from his quarry. It generated such success that he received constant media attention and people lined up in their cars on the road to his property as if they were taking a pilgrimage to Lourdes. At the time that I interviewed Schindele, he spoke passionately about saving the dying forests with rock dust. Many news headlines in the late 1980s focused on the dying forests, forests declining in Europe and the US due to stress from acid rain and the accumulation of heavy metals in forest soils. Remineralization neutralizes the pH, creating a buffer so that heavy metals are not taken up by the plants and trees. Dr. Robert Bruck, Ph.D., a well-known forestry pathologist, observed remarkable recoveries from air pollution effects from application of mineral slurries and/or dusts in the Black Forest. 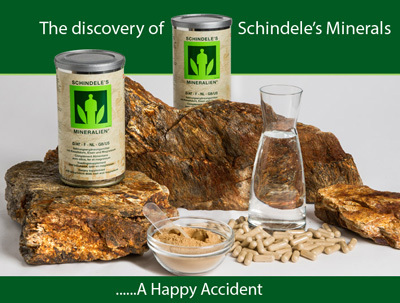 Schindele also began taking it internally and realized it was very good for people as well, a discovery which led him to begin selling finely ground rock dust as a health supplement. He originally called his product SuperBiomin and sold it to 6,000 pharmacies in Europe. It can currently be found under the label Schindele's Minerals and continues to be readily available in Europe. Schindele's product was even used in the wake of the Chernobyl disaster. Peter Tompkins and Christopher Bird explain in their 1989 book Secrets of the Soil that when "the University of Vienna found that Schindele's product worked against radioactivity–a claim confirmed by a Soviet institute for atomic physics in the Ukraine–the Soviets sent a truck to pick up two thousand kilograms of his Gesteinsmehl. Analysis under a micropolariscope revealed an alteration in the molecular and atomic lattice, which had an effect on ionized radioactive particles taken into the body”. Ironically, in hindsight, a Japanese film team came to Europe to document the delivery and distribution of rock dust to radiation victims for the Japanese news. "To achieve maintenance of homeostasis, biological organisms use highly organized structures, intricately designed from a diverse set of molecular and atomic building blocks to carry out the many tasks involved in healthy functioning. Metal ions such as minerals and trace elements are used in biological systems for such important tasks as catalyzing biological reactions and stabilizing complex protein structures. This is why it is so important for any biological system to have access to a broad spectrum of minerals and trace elements. It is also one of the root causes of radiation sickness, as the destructive atomic forces of radioactive particles alter natural metal ions, damaging the delicate biological structures in which they play an integral part. The intelligence of Nature tends to work to maintain health. Life on earth has evolved systems to selectively incorporate healthy minerals and trace elements into biological structures, and to repair the damage done by low levels of radiation, which is a common phenomenon even in Nature. Plants, for example, will selectively uptake healthy metals over radioactive particles if given the choice. However, under high levels of radioactive stress such as those encountered during a nuclear disaster, those systems become stressed and cannot cope with the damage, resulting in radiation sickness. Replenishing these systems with remineralized foods or a finely ground rock dust supplement is an important part of coping with this unprecedented radioactive stress." Given the recent disaster in northeast Japan, it is timely and urgent to get this information out on behalf of the disaster victims as well as others as the radiation circulates around the globe and throughout the biosphere, adding to our already present toxic overload. A quick study could be created to monitor a group of subjects with high levels of radiation, giving about 1 tsp 3/day of an appropriate source of rock dust (or trial various sources) over a period of 10-14 days or more, compared with a control to see if it can be shown that radiation levels are lowered and bioremediated by rock dust supplementation. It is tremendously important to remineralize our soils as well as ourselves. It is quite clear that remineralization bioremediates whether for soil, animals or humans, whether radiation or other toxic contaminants. Rock dust for bioremediation is a simple, natural and inexpensive means of alleviating the impact of radiation. As history shows through the Chernobyl disaster, remineralization makes a significant difference. Schindele's Mineralien was examined at the University of Vienna under a micropolariscope. It revealed an alteration of the atomic lattice with a regression to orthoclase, a process which generates an electrical potential which changes its polarity each time it is emitted, thus producing plus and minus electricity alternately. Moreover it was discovered that the mineral product has a positive pole, cell membrane stimulating magnetic pulsation termed DIN OD 144. Via the alteration of the atomic lattice, the relatively large amount (approximately 10-15 g per day), which is recommended as a daily food supplement, has an effect on any ionized radioactive particles taken in by the body.